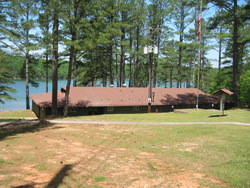 The park is located of off Bartow Carver Road, which is about two miles east of Red Top Mountain. 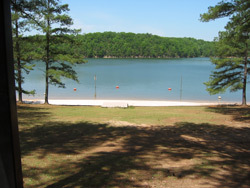 Bartow County Park is relatively large. 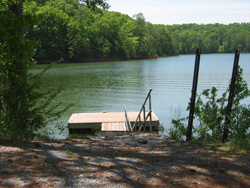 There is a boat launch and two rental facilities. The first of these is a large building suitable for group parties. There are bathrooms, a kitchen facilities, tables and chairs for use in the building. Out back is a porch area with a few barbeque grilles, some rocking chairs and access to the lake shore beach. There are also two playground areas. 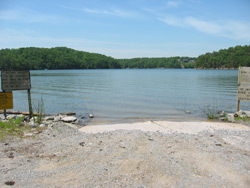 One offers swings in a spot along the shore of Lake Allatoona. The other is a playscape and is on the side of the building away from the lake. 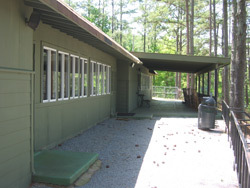 The second group facility for rent is a picnic pavilion. It consists of a covered area with picnic tables and grilles. To make reservations you can call 770-974-6053. 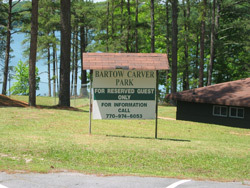 The other two notable things about Bartow Carver Park is its boat ramp and hiking trails. The boat ramp is a small one lane concrete structure. There is also a small boat loading dock off to one side. The parking area is small and both it, the place to turn around and the space leading up the boat ramp are rough gravel rather than being paved. The ramp is open from 8 AM to 9 PM. There is no fishing allowed from the shore. 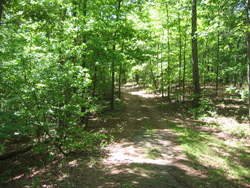 Hiking in the park is confined to a few dirt access roads. The photo on the left shows a view of the small swimming beach. This beach is only for use by people that are renting the group use building. The photo on the left shows one of the hiking trails in the park. Two views of the group use building. The left shows what you see when you pull down into this area and the right shows the back porch of the building. The view of the beach (see the previous pictures) is taken from the porch area. Another view from the back porch. 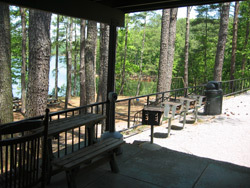 The lake is off to the left and the barbeque grills that are available for group use are show. Behind the grilles and off of the porch is a swingset. There are also picnic tables scattered around in the woods. 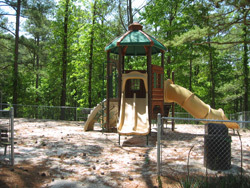 The playscape on the right is off to one side of the building, in an area away from the shore of Lake Allatoona. 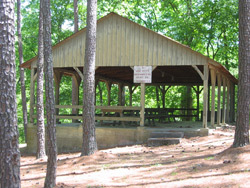 Many of the facilities in the Bartow Carver Park are only for use by people that pay to use the group facilities. The picture on the right shows the picnic pavilion that can be reserved for a fee. It is located off to one side of the larger group use building. The Bartow Carver Park boat launch loading dock and the one lane ramp. There is a small unpaved area where you can turn your rig around.